Back in May the lovely World’s Apart launched a competition on tots100 to win a chance to by toy testers for them. My post Outdoor adventures was picked as one of the winners. I was delighted, I am a big fan of World’s Apart and have several of their products, I find them good value, sturdy and durable. The torch nightlights are a big hit. When a package arrived, we opened it and my youngest Tyler had the biggest smile I have ever seen on his little face. He absolutely loves pooh bear. We have a mummy one, daddy one, Lucas one and Tyler one. This one however it his favourite and goes everywhere with him. 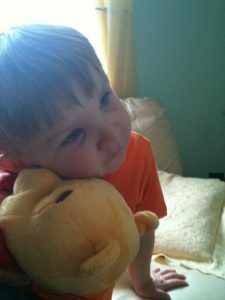 Having recently watched the Winnie the Pooh DVD, he was in awe at Winnie the Pooh talking back to him. He thinks he has the real live Winnie the Pooh. Just look at his little face below for proof. Even with his chicken pox. I think this toy is one of the best I have ever seen, being interactive you would think he might be a little hard and bumpy, having a battery compartment and all, but no. He is so soft and cuddle that he can be taken to bed and hugged all night long. When you first take Pooh bear out of his box, he requires to be setup. This is very simple to do, but you are best to read the instructions first, last thing you want is pooh bear talking to you child in the middle of the night. Not sure that will warrant a good night’s sleep. First of all you set the time, this is done in 1/2 hourly jumps. Set by pressing his nose and hand for confirmation. Next you set what time you would like your child to get up at. This is a fantastic way of getting your child to stay in bed until it is a semi decent hour. “Has Pooh Bear woken up yet? No, well it’s still sleepy time.” We’ve all been there. Lunch time can also be set, with similar hunny eating activities, along with dinner time. Bed time is my favourite setting. You can set Pooh to tell your child when it is time for bed, to put your pyjamas one, brush your teeth and sit and read a nice bed time story. There are setting and choices for you to select her. I think this setting is fantastic and can really help install a great bedtime routine. Both boys have been going to bed when Pooh Bear says, mummy and daddy don’t count anymore. As long as they are going, I don’t mind who is encouraging them. 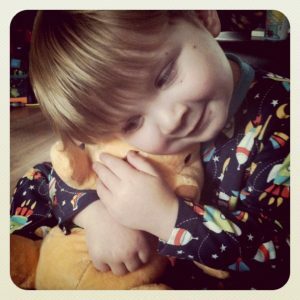 Last thing before sleepy time, Winnie the Pooh says “Goodnight friend.” Tyler then give him a cuddle and a kiss and says “Goodnight Pooh Pooh.” Yes I know, but he’s a boy and they find that funny. If the press his nose or hand past bed time, Pooh bear snores away. So they won’t be up all night playing with him. Winnie the Pooh Interactive friends isn’t all about installing a great routine in your toddlers life, now, he’s also about having fun. I think one of his best features is the ability to play hide and seek with your child. You hold his hand and he plays hide and seek. You or your child goes and hides him and Pooh bear will keep talking until he is found, saying “I’m over here” and such like. If you take to long, he will fall asleep, just in case your child gets distracted. When he is found you press his paw again and he says “Well done.” Both my boys play this game for hours, taking turns to hide and then find him. Pressing his hand and nose, he will say random phrases like, there’s a wozzle over there. He is so cute and sweet and so cuddley. He is programmed with over 50 phrases, so no chance of the little ones getting bored with him repeating himself. All in all, I cannot praise this toy enough, it has brought so much joy and happiness into our house. He has helped structure a better routine for Tyler and gives him a little friend to comfort him at night if needed. I have to say he is also very durable and well made. He is taken everywhere. Here he is at Gran and Grandpa’s house. 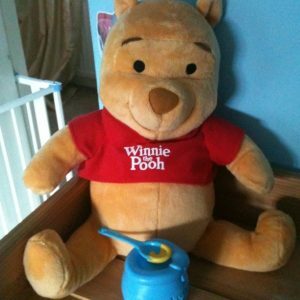 You cannot go wrong with this toy, the Interactive Winnie the Pooh is a perfect pre-school toy. It’s fun, soft, cuddly, engaging and inviting toy. There is so much to do with him and like I said the routine makes him a parents dream toy too. At RRP of £39.99 I think he is very good value for money. He can be purchased from Argos, Tesco and Amazon. A great toy for that Christmas list, yes it is only just around the corner. 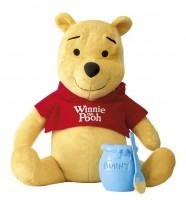 There is a chance to win your very own Winnie the Pooh Interactive Friend on the Disney Website. Also don’t forget to follow World’s Apart on Twitter and Facebook to keep you up to date for all their products and offers. Disclaimer:- I won the chance to review this toy and did not let this interfere with my judgement to give an honest review. Hi, thanks for the awesome review and instructions!. Can you download the instructions for the Winnie the pooh interactive friend by Worlds apart. I have Winnie the Pooh but my instructions are ruined!!!!. Any Help would be appreciated!!. Thank you. Glad you liked it. I am sorry I don’t have the instructions. The website might have some archives on them?